Deliver an amazing - and effortless! - Easter dinner to the special people in your life with our Easter Special Combo. Order today to get it SHIPPED FREE! 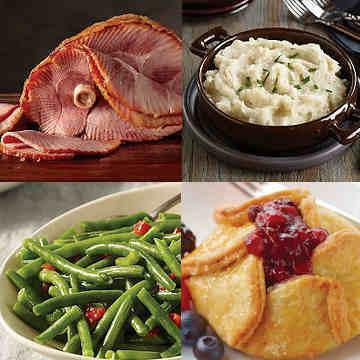 They'll love the easy gourmet tastes like our fully-cooked, oven-ready Spiral Sliced Ham and heat-and-serve Roasted Garlic Mashed Potatoes, and you'll love the value, savings, and happiness! Thaw in refrigerator for 24 to 48 hours. Spiral Sliced Ham is fully cooked making it possible to serve directly from the refrigerator. Oven: preheat oven to 325�F. Remove Spiral Sliced Ham from film and foil. Place ham cut side down on a raised edge baking pan lined with foil. Heat, uncovered, for 60-75 minutes for entire ham or 10 minutes per pound for smaller portions. Do Not Thaw! Bake: Preheat oven to 400 degrees F. Remove Tartlet from cellophane bag. Place on foil lined baking sheet allowing space between each piece. Bake for 18-20 minutes. Microwave:* Remove tartlet from cellophane bag. Place on microwave safe plate. Microwave on HIGH for 60-70 seconds. *Cooking time based on 1100-watt microwave with turntable. Adjust time for lower wattage microwaves. If not using a turntable, rotate once while cooking. Ingredients: Enriched Flour (Wheat Flour, Niacin, Reduced Iron, Thiamine Mononitrate, Riboflavin, Folic Acid), Apples, Vegetable Oil Shortening (Palm and Modified Palm Oils), Sugar, Water, Blueberries, Blackberries, Modified Tapioca Starch, Raspberries, Glaze (Sugar, Agar Agar), Eggs, Salt, Dextrose, White Vinegar, Liquid Invert Sugar, Concentrated Lemon Juice, Yeast, Enzymes, Cinnamon, Caramel Color, Natural Flavor (Milk), Guar Gum, Xanthan Gum, Calcium Citrate. MAY CONTAIN: ALMONDS, PECANS, SOY, AND COCONUT.